Seriously.How do people live without one? !They make preparing dinner extremely easy and doable!The flavor in this recipe is incredible! We all loved it! Mix softened cream cheese, cream of chicken and Italian Seasoning together and dump evenly over chicken. Cook on high for 4-6 hours or until chicken is fully cooked and tender. This looks tasty AND easy! Will definitely put on our list for busy weeknights! This looks awesome, I am going to have to try it out! Thanks for the follow, I am following oyu back! Used my crock pot yesterday to make pot roast. I feel you. Amazing, looks delish. Think it'd be good over gnocci? This looks great! I love meals like this. I've never bought italian dressing seasoning. Is it found in the section with the salad dressings or somewhere else? Perfect timing, Nikki! I tried a chicken crock pot recipe last week that just didn't quite do it for us, if you know what I mean... I was trying to decide how to tweak it... this recipe will do the trick, I think! Thanks for sharing! Totally making this this week. It looks so yummy! Thanks for sharing the recipe! @Jerri Yes, it is by the dressings, it's in a packet. You can use either the regular or zesty flavor! Hi! A friend of mine passed along this link to me. So glad she did. Now following! I just cooked this today and it was soooo good! crock pot italian chicken was amazing! How much Italian seasoning do you use? I have plenty of home- so no need to buy the packet- just curious how much you add! Made this for the hubs the other night, and his face lit up on the first bite as he said 'holy crap! that's good!'.. he even licked the spoon and said 'it's so good! like ice cream!'.. i'll be making this again! I've made a variation of this before over bowtie pasta and it is soooo good! When making this the first time, before adding the sour cream or soups or anything, I placed cubed chicken in my crock pot with butter and the pk of Italian dressing mix and let it cook about 4 hrs on low. This by itself is amazing, so I've made this several different times using chicken breast halves. Both ways are delicious! How big of a can of cream of chicken? Small can or large family size can? This is so tasty! One of my favorite recipes! You can also use Ranch packets to! We love both!!! I wanted to make this so bad, but I didn't have cream of chicken or an italian seasoning packet. I used cream of mushroom and 1/4 bottle italian dressing, and it was SO GOOD. I saved some extra sauce to eat just over rice, and I couldn't stop licking the spoon. This was so yummy. I thought it was a bit salty though- I'm guessing from the Italian mix. I think next time I will use low sodium cream of chicken. My husband and I really enjoyed this over rice! Just a hint for those who might be afraid to leave their crock on in case they work late (and dont have the fancy kind with the timers to auto-turn off...) I put my crock on an outlet timer (like I use for my christmas tree). My crock just has the hard switch that turns to warm, low or high, so I leave that set on low, and the timer is set to turn on around noon, and off around 5, in case I'm not home one time. I have made this and it is easy and very tasty. This recipe is so GOOD! My family loves it very much and it's a breeze to make. Love it! 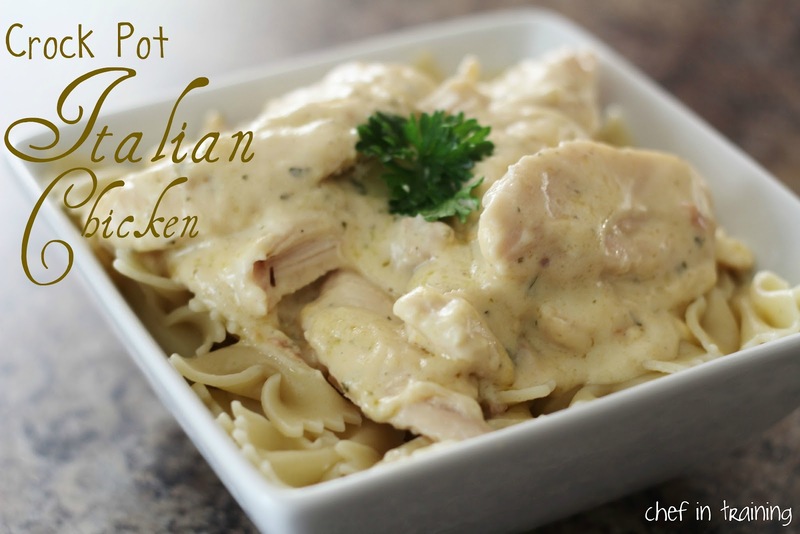 Have this in the crockpot right now--noticed I had bought already seasoned chicken breasts so I just used the cream chicken soup and cream cheese--can't wait for supper!!! Omg! I cannot believe I have never thought of this!! I'm not home to turn the crockpot on in the afternoon but this will do it! Thanks so much, you've changed life in our house! I'm trying this one tonight! I made this recipe tonight for dinner & it was AMAZING!! I used the chicken tenders a large size package and followed the recipe exactly. I dumped it all directly over the chicken in the crock pot and it spreads out nicely and cooks amazing, you may think there's not enough sauce but it works out perfectly! I served it over the bowtie pasta. When my bowtie pasta was done I stirred it into the chicken in the pressure cooker and mixed it all up and it was heavenly! You gotta try this recipe! So easy & very cheap. Only cost me like 10.00 to make a large amount of it. Could I cook this on low instead of high? Wonder how long it'd take to cook on low? Anyone know? Because of my work schedule I need an 8 hour crock pot recipe. Would this work on low in stead of high? The best way to make this recipe is to start with the soup, butter, chicken, and Italian seasoning and let those cook together for about 6-7 hours on low. Then when the chicken is ready to fall apart, take the chicken out and shred. Then put the block of cream cheese in and let it melt. On high, it melts in 30 minutes. Then put the shredded chicken back in and serve over pasta or rice. This is so easy and so delicious!! Put your crockpot on a timer! One of those you plug in and then plug the crockpot into (I have my coffee pot on one) - and walla no more worries. Just made this tonight! It was YUMMY!!! I made it for my grandma who just had surgery. I used a whole bag of frozen chicken breast, 1 can of cream of celery(what I had on hand), 1 block of low fat cream cheese,a packet and half of italian dressing seasoning, and a 1/2 cup of italian dressing. The sauce was a little watery but VERY tasty!!! Is it normal for the outskirts of the dressings to burn a little? Makes me wonder if I should put it on low. I really want to try this but what is Italian seasoning dressing? Is it Italian salad dressing? And what is one package? I am cooking this now, and my sauce is very thick.. is this normal. there isnt a whole lot of it.. and do i shred the chicken into peices? I found this recipe on Pinterest and I am making it right now. It looks so good! OH, and I also cooked on LOW for 4 hours... PLENTY of time, and the chicken was done and juicy! I shredded my chicken (into medium size chunks), in the crockpot, before serving. Next time I make this, I will be adding broccoli florets! I'm from Germany and hubby just retired from the NAVY after 20 years. I found your website on Pinterest. I made this Chicken in our Crockpot and it was just soooooooo delicious!!! This one is a keeper in my German recipe box!!! Nikki, Thank You so much for this great website!! I will def cook more of your recipes!! Make this all the time. I even blanch some bent carrots and green beans and put it in the crock and cook it all together. You have your vegetables then and no need to cook any to serve with the meal. Serve with mashed potatoes. The sauce seems thin, could I add some cornstarch to thicken it?? Thanks. I added a can of mushrooms to the mix shortly before I served it. Delicious! A friend shared this on Facebook & I'm making it tomorrow!! Cannot wait. I loved all your reviews! Thank you! How can I thicken this sauce? It's a bit thin...The picture above shows a much thicker white sauce...could I use some cornstarch? Thanks. I cooked 16ox of bow tie pasta until slightly under done and then added it to the mixture for the last 30-45 minutes on low. It soaked up the extra liquid. Mine was not runny before i added it, but the extra did disappear. This was a big hit at my house. I will continue to make it and possibly make some additions. Looks better than it tasted. The sauce had a "preservative" taste to it. Would love to have a recipe similar to this without canned soup. 3rd time making this, . creamy and very flavorful and so easy. I have made the Italian Chicken several times & has become one of our favorite dishes. Thank youChef in training for this delicious recipe.